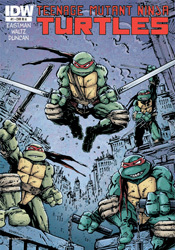 With no less than eight different titles in its past, each bearing their own unique set of continuity implications, one might think the ship has sailed on ever truly rebooting the famed TMNT license. And, considering the somewhat speckled public reaction to the turtles' animated relaunch efforts, the timing of another fresh take might be considered suspect as well. However, considering the tidal wave of responsibilities associated with the franchise which forced co-creators Kevin Eastman and Peter Laird to abandon their initial run very early in its publication lifespan, perhaps those recent bumps in the road are a blessing in disguise. After all, without a hundred different licensing opportunities clouding its vision, the timing could finally be right for the book’s original promise to shine brightly once again. In practice, it’s a total flop. Eastman’s return to the property that made him famous is a lifeless reinvention, a gruelingly dated “new” direction with a strange set of priorities. In rushing to poke fun at the exaggerations of the original series, particularly those that were most played up in the classic Saturday morning cartoon, the writing comes off as jaded and bitter, a classic knee-jerk overreaction. Where Eastman is looking for a sharp, biting edge, it feels instead like he’s taking target practice at point-blank distances, at times even disrespecting the very core of the characters themselves. The issue’s plot structure is a total mess, too. After dedicating its entire front end to a brainless, baseless fight scene, the narration leaps to an equally futile new point of genesis for the fearsome foursome. Without giving anything away, I’ll note that the axis of their origin has shifted from the classic “discarded toxic waste in the sewers” to something much more generic and overplayed. And, considering the amount of characters that owe their livelihoods to the presence of radioactive materials, that’s really saying something. Surrounding the four infant turtles is a cast of familiar names in reinterpreted roles. April, Splinter, Baxter Stockman, Krang, Casey Jones – they’re all here, but they’ve each been fundamentally altered for no discernible purpose beyond the capacity to say it’s fresh material. With Peter Laird declining to participate in the new series and Eastman content with co-writing and layout credits, the chore of actually illustrating this issue falls to up-and-comer Dan Duncan, fresh off a run on Image’s creator-owned The Butler. Duncan’s loose, frenetic work shows a ton of potential elsewhere, particularly on his personal blog and DeviantArt page, but within the confines of TMNT it’s disorganized, constantly muddied and completely forgettable. I’m not sure if the blame can be placed on the pressures of such a high profile gig, the presence of Eastman’s guiding layouts or a tight deadline, but it’s a total miss in every aspect from a guy who seemed to be a surefire prospect. In no uncertain terms, this isn’t an issue to even entertain opening. If the plot alone wasn’t enough to leave me squinting my eyes and slowly shaking my head, the artwork would’ve straight-up chased me out of town. A desperate cash-in on a dead property, it captures neither the spirit nor the adventurous nature of the original. Some franchises are best left to the crows. Skip it.